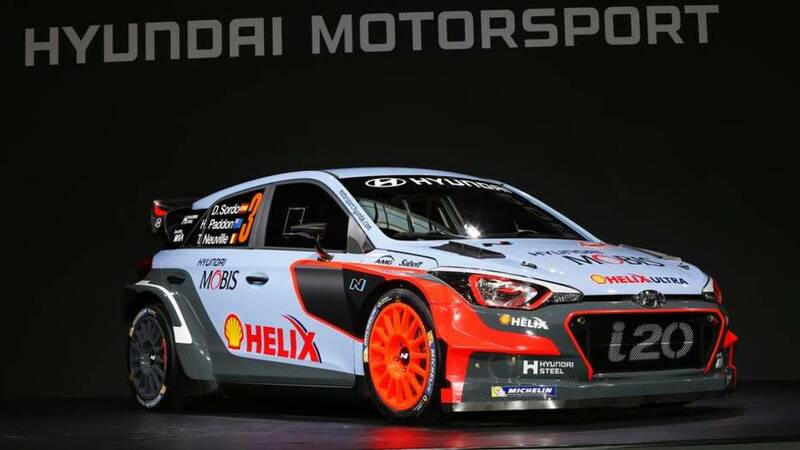 Yesterday at its German headquarters, Hyundai Motorsport unveiled the next generation i20 WRC. Piggybacking off its success in last year's World Rally Championship and the new WRC-spec i20, Hyundai is finally releasing an R5 edition of its five-door hatch. The R5-spec car will be able to compete in more events than the WRC version, and will bring an even heavier Hyundai presence. The new i20 WRC sports a turbocharged 1.6-liter I4 capable of 300 hp at 6,000 rpm and 295 ft-lbs of torque – no change from last season. Naturally a paddle-shifted sequential gearbox sends the power to the front and rear mechanical differntials -- also the same from last year. In fact, there doesn’t appear to be a big change in any of the hardware, besides the body of course. Hyundai says that this new car is stiffer and more capable than last season's ride. The car still sports a Shell and Mobis livery and carries over many of the styling characteristics of the previous model. It only takes one trip to the pits of a WRC event to see that Hyundai has clear intentions with its racing program – winning. Unlike the normal service areas that generally include a tent for the cars, a semi-trailer and a rest area for staff, Hyundai drags a completely enclosed garage to every event. With all the experience the drivers have had with the Hyundai i20 WRC cars, the improved car might put Hyundai in a spot to take the championship. Watch out Volkswagen, Hyundai is coming for you.